This little bike shop on Treasure Island is inspiring art and transgender pride while inspiring cyclists to enjoy the island even before the Bay Bridge bike lane opens. There are already a number of carless options for getting there. More on that here. 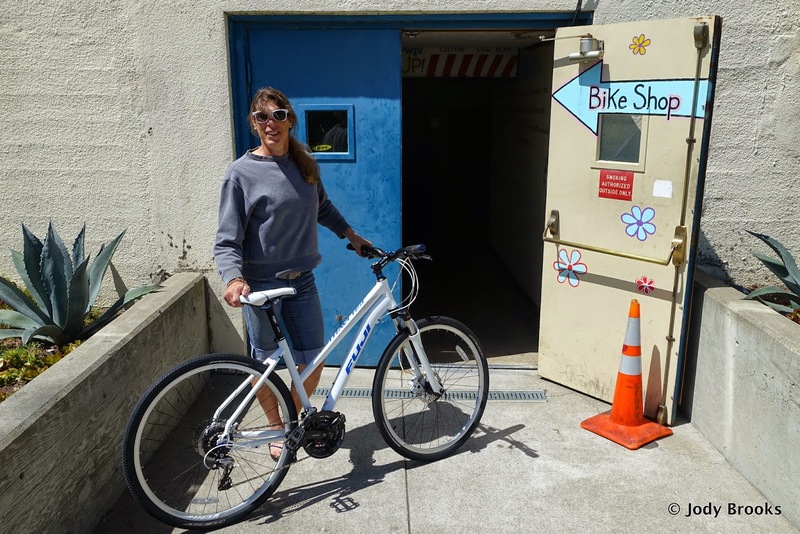 Although the bike lane on the eastern span of the Bay Bridge won't be completed for a few years yet, the island is ready for cycling now thanks to A Tran's Bay Bike Shop. In January 2013, Tammy Powers, a Long Island-born life-long lover of bicycles, opened A Tran's Bay Bike Shop. It is nestled in the basement of Building One, the first building you see on the island. Tammy is an authorized Fuji dealer. She's also got a fleet of new beach cruisers for sale or rent, as well as assorted others including folding bikes (that fit anyone in seconds). However, the bikes that really catch your eye are the gorgeous vintage Schwinn cruisers from the 60s and 70s and the stretch chopper bicycle! These are just for rent but so fun. I rented all three for a party on the island and they were a huge hit, as evident from some of these pictures. To keep them all rolling, Tammy carries tubes and tires for 650, 700, and 26" wheels. The bike shop is unique simply by being the only one on this very unique island. However, the actual space the shop is in is truly cool. "I love, love, love the space I'm in, there is no other space for lease on this island that is closer to the Bay Bridge. After my first 18 months in business, I doubled the square footage of my shop. ", Tammy says. "I didn't exactly 'choose' this space. Originally T.I.D.A. (Treasure Island Development Authority) was showing me other spaces around the island, and I couldn't envision any of them being the right place. T.I.D.A. almost didn't even show me this space. They figured 'who would want some place below ground level in the back of a historic building', but when they showed it to me, I knew it was the one! ", Tammy says. Given its unique position in the back of Building One, it can be a little tricky to find. Tammy can't have a permanent sign out on the road so it is only there when the shop is open. Nevertheless, the bike shop is easy to get to once you know where to go. The first right you can take once on the island is into the parking lot for the Treasure Island Bar & Grill and the Treasure Island Yacht Club. That is also the best way to get to A Tran's Bay Bike Shop because the entrance to the basement of Building One is behind the Treasure Island Bar & Grill and Treasure Island Yacht Club. In fact, the folks in the restaurant are happy to give directions when asked. Given its central location to the island in general and to where cyclists will eventually be spilling down from the new bike lane, the bike shop is perfectly positioned to help both present and future cyclists enjoy the island. The bikes and the space aren't the only attraction at A Tran's Bay Bike Shop. There's the art. Tammy, with the help of some local artists, has turned the cozy windowless space into a sprawling gallery of bold, colorful, art and artifacts. The list goes on. Around every corner are really great giant works of art, some of which defy description. All this stuff is waiting inside A Tran's Bay Bike to charm the heck out of anyone who enters. Tammy deeply appreciates how the artists can see what is not yet there. They have vision. So does Tammy. 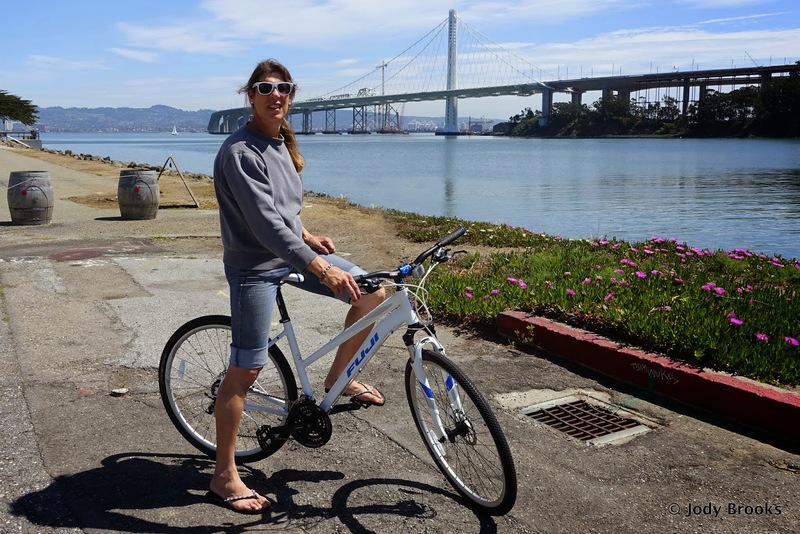 "I was simply visiting a friend on the island and while staring at the unfinished Bay Bridge, I had the epiphany of this island NEEDING a bike shop once the bike lane is finished. ", she says. She can't wait for the new Bay Bridge bike lane to open. "My entire business plan is based upon the massive amount of people that will be arriving once that bike lane opens... you bet your begonias I'm looking forward to it happening", Tammy says. She also has a vision to be an example for transgender business owners. For her, the name on the bike shop says it all: "A Tran's Bay Bike Shop". Although she has other business names in mind for future projects, right now this one matters. "I've been into bikes since I was a kid, pulled apart my coaster brake when I was 10 or 11 just to understand how it worked. I've worked at bicycle shops ever since I lived in Colorado...I am an excellent mechanic with superb customer service skills", Tammy says. Unfortunately, "few people want to hire 'us'", she says with frustration, referring to transgender folks. So she hired herself by starting this business. Small wonder Tammy wants it known this is a transgender-sponsored, transgender-run, enterprise. She expects to be hiring in the near future and transgender folks will most definitely be considered. Like the island itself, A Tran's Bay Bike Shop is a charming oasis for cyclists, whether they have a bike in need of service or they are bike-less and suddenly inspired to ride. It is also so much more. Definitely, worth a visit.